Lore is the eldest daughter of a German family at the end of World War II. Hitler’s on the outs, the Allies have won, and it’s just a bad time to be a German in Germany. So as the Third Reich falls, Lore and her family uproot their lives to go live in a cabin in the woods. Before long, her parents both leave in the hopes of escaping persecution. Shortly thereafter, Lore and her siblings are forced to leave as well. With a dwindling supply of food and five mouths to feed, Lore struggles to help her family survive as they make their way across Germany by foot. And just when it seems that all is lost, an unlikely stranger comes to their assistance. I don’t know about you, but I can’t think of too many movies that approach the Holocaust from this angle. No big surprise there. The only ones that come to mind are Valkyrie and The Sound of Music, and while they worked to varying degrees, they were going for something else. This is a German survival story told through predominantly German eyes, one of the rare few that I’m aware of. Reading that back, it sounds like an oxymoron, like revisionist history to a degree. And while I can’t imagine this is swaying anyone to give it a fair shake, the payoff is worth it for those who do. See, the reason this story manages to be effective without being insensitive is due almost entirely to the age of these characters. Make no mistake, Lore’s parents are bonafide, decorated Nazis, ones that live, breathe and would ultimately die for their fuhrer’s cause. If this had been their story, I’d be singing a different tune. But since it’s not, there’s sympathy to be found (amazingly enough). That’s because these kids aren’t their parents. If they went to school and yelled “Heil Hitler” during the morning announcements, they weren’t doing it because they were believers, they did it because they’re kids, because they don’t know any better. They can barely dress themselves let alone be blamed for their circumstances, and they’re too young and too innocent to deserve the hand they’re dealt. All they care about is finding food and their parents, and if some kind soul decides to help them with either, who really cares if they’re German or Jew? Lore, on the other hand, is the eldest of these kids. She’s old enough to know the reality of their situation, of her parents’ situation, of her country’s situation. The burden is on her to grow up fast and keep everyone alive, and the resentment she harbors is towards the enemies of the fatherland. With that said, the most noteworthy difference between Lore and her siblings – aside from being the new matriarch of the family – is that she’s the only one who’s indoctrinated. So when she discovers that the unlikely stranger they cross paths with is none other than a Jew, she speaks to him with hate as he puts food on their table. As a result, it’s this relationship between Lore and Thomas that brings the story to a new level. Again, I can’t think of too many – scratch that – any movies that approach the Holocaust and those involved from such a one-on-one perspective as this. More often than not, the German in question in still very much in power while the Jew in question is very much not. So when the two parties meet in a situation like this, in dire straits and dependent on one another, it’s fascinating to watch them evolve. We see Lore go from a loud and proud Hitler Youth to a vision of self-doubt as her worldview crumbles around her. And as for Thomas, Thomas is something of a mystery, someone whose intentions are good and motivations unclear. It’s a relationship that changes in ways that I nor the characters themselves were expecting and it makes for a profound, if not microcosmic metaphor for the relationship between their people. Still, it’s strange. From beginning to end, it’s hard to forget that Lore and her siblings are German, that in the grand scheme of unspeakable horrors that occurred during their lifetime, their struggles aren’t the ones I should be invested in. I don’t think I’m alone in this line of thought as it’s an instinctual one to come to. Thomas is the one I should be caring about. But therein lies the beauty of Lore. By making it about these kids, by putting them in this situation, by bringing them down to the same level as the one person they’ve been raised to hate and the one person who actually helps them, it serves to remind us of their humanity. I can’t imagine this was an easy story to sell or tell, but it’s truly impressive the way writer/director Cate Shortland manages to tread this line. It doesn’t take away from the Jewish experience or try to glorify the Germans in any way, shape or form. It’s a story about shared experiences and the common bonds between us, even in the face of genocide, even after humanity has been systematically stripped away. Needless to say, it is a harrowing story. There isn’t much said and much of the plot is driven by one stark roadblock after another. It sounds weird from the outset, but I liked that about Lore. With imagery like this, with their world the way it is, words aren’t needed to drive home the gravity. A little goes a long way, and the same is true for the fantastic performance from Saskia Rosendahl. As Lore herself, she’s incredibly convincing as she’s forced into this role of both sister and keeper. Everything she’s going through you can just read on her face, and, like Lore, it’s a performance that you’d expect to come from someone older. Just a fantastic and fascinating character all around that leaves you thinking about her long after you’ve parted ways. Believe it or not, it helps to be in the right mood with this one, but it’s an important and moving one at that. Granted, that comes as something of a given when you’re dealing with the Holocaust, a period in human history that always bears reiterating. And not to take away from the stories that have been told, but it’s always interesting to look at history from a new angle, especially one that puts things in such a perspective as this does. If anything, Lore ought to be commended for taking the road less traveled, a road I never imagined taking. It could have gone horribly, it could have been deplored, yet it’s anything but. And for that reason alone, it deserves to be seen. Good Review! I enjoyed this one as well. Bit of a slow burner but the story and the performances are great, definitely worth checking it out. Thanks, man! For a minute there I thought I was this movie’s only patron, glad to hear I’m not. Glad you dug it as well, it’s a good’n. Nice review! Looks like I should check this out sometime! Thanks! And do it to it, it’s a good’n. Would love to hear your thoughts if you do. From the description the tone sounds very similar to Revanche, which I finally got around to watching and liked a lot. Will definitely add this to the movie list. Oh man, Revanche is the one of the greats. I haven’t seen that in years, glad to hear you liked it, hard to imagine someone not liking it actually. Like Revanche, this one’s an insightful slow burn that has some fantastic, complex character development going for it. Didn’t make the connection at first given the historical circumstances are so different, but the more I think about it, the more I’m realizing you’re dead-on. Keep me posted if you check it out, would love to hear your thoughts. This definitely looks like one to watch soon. During my final year at university starting in September, I’m taking a Holocaust unit and my dissertation is on female directors so this ticks both boxes. Oh man, you hit the jackpot! Would love to hear your thoughts, it’s a good’n. 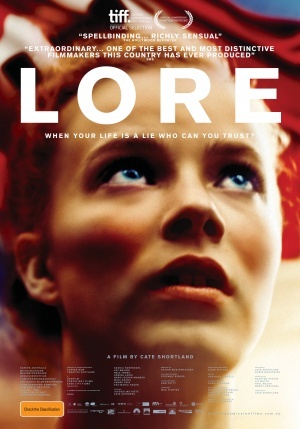 Lore (2013) – What the Hell Should I Watch on NETFLIX?